… in fact, we’ve been having a bit of a do for the last few months! That’s because this year marks the 40th year of the old Urmston Baptist and Congregational churches coming together to form Greenfield Church. So we’ve been making a bit of a fuss of ourselves with a reunion service, a Flower Festival, special guest services and more! And this month, we’re having yet more celebrations. Because you can’t celebrate without having a party, can you? 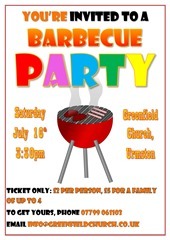 So that’s what we’re going to do on 16th July: have a party and, because it’s summer and it will be nice (he says…), a barbecue as well. There’ll be all kinds of fun and games and fantastic food as well. So come and join us! You need to buy your ticket in advance, so we know how many to cater for, but they’re a bargain: just £2 each or only £5 for a family of up to 4. So come and join us and help us celebrate on July 16th – we’d love to see you!